Do you fancy cycling 400 kilometres in a weekend? 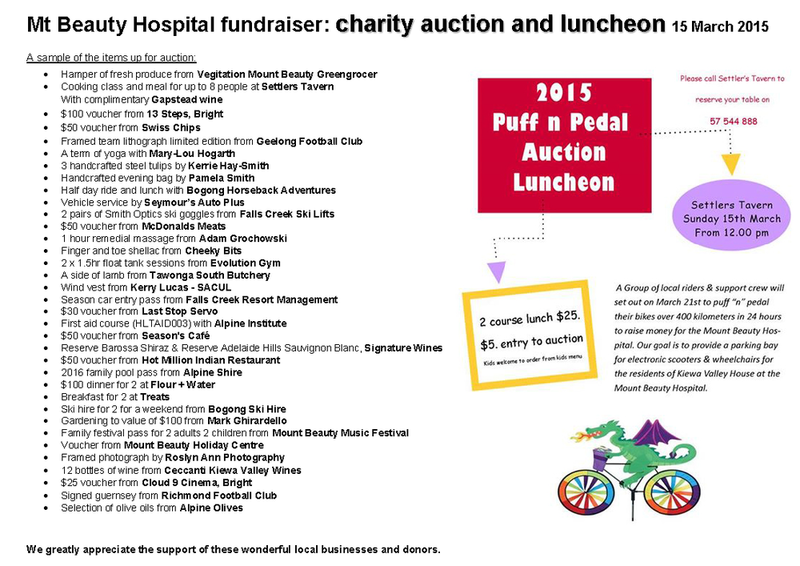 Yet the Mt Beauty hospital "Puff ‘n’ Pedal" team are doing exactly that again this year as a fundraiser. So where do you and I come into it? In support, of course! You can sponsor the riders via their My Cause page. Or, get along to their charity auction in Mt Beauty on Sunday (March 15th) and pick yourself up some of the local goodies on offer. Oh, and you can even keep up with the team’s adventures via facebook - https://www.facebook.com/PuffNPedal. Let’s see - lunch in Mt Beauty and charity auction; online donation; and/or a ‘like’ or ‘follow’ on facebook - they each sound quite painless compared to all that cycling, to me!